Less than two days before Scots hit the polls, social media has been a primary platform in shaping the merits of union vs. independence. With millions of posts, shares and related content flooding the web, Thursday’s vote may very well teeter on a tweet. According to new research from the University of Strathclyde, the referendum inspired more than 10m ‘interactions’ on Facebook over a five week period – one of the highest levels of activity recorded by the company. These types of interactions include comments, campaign groups and sharing videos and images relating to the referendum. While both unionist and pro-independence campaign groups currently poll neck and neck, the research shows that if social media activity were to determine the outcome of the vote, the ‘Yes’ campaign would have a slight lead, with 2.05 million interactions, compared to the ‘No’ side’s 1.95 million. 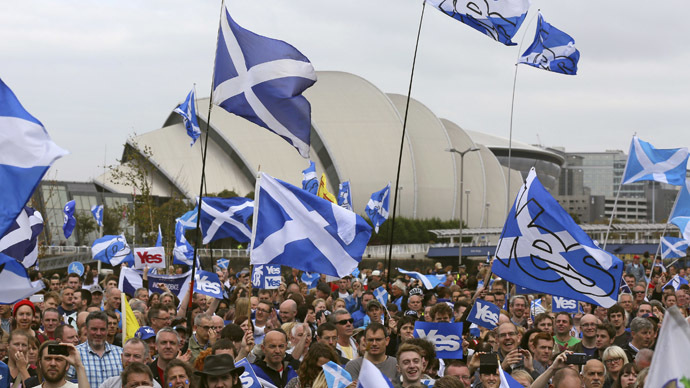 The research also suggests that there were around 275,000 referendum-based interactions per day, with the vast majority of comments coming from Scots themselves. Additionally, if Facebook groups are anything to go by, then ‘Yes’ campaigners should see a landslide victory. 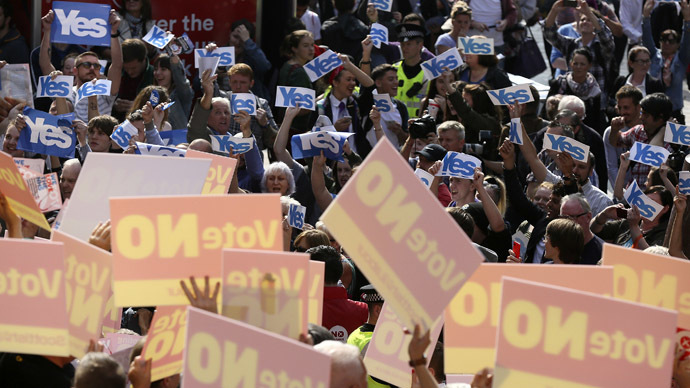 While the official ‘No’ campaign page has 207,033 Facebook ‘likes’ at present, the ‘Yes’ campaign has over 300,000. But just how reliable is social media activity when it comes to voting? "Studies show that when people see their Facebook friends talking about voting, they are more likely to vote themselves,"Elizabeth Linder, Facebook’s politics and government specialist for Europe and MENA told the International Business Times. While social media analysts generally agree with the statement, some argue that monitoring activity via Facebook doesn’t depict an accurate picture of voter behavior or turnout. “There is no direct relationship… There’s no denying that it’s influential, however,” Carl Miller, researcher at the Centre of Social media Analysis told Sky News. “A lot of the literature looking at elections and why we vote, point to a person’s immediate social network as being the most influential factor,” he added. According to the research, produced by Professors Mark Shephard and Stephen Quinlan, as a whole, social media interactions relating to the referendum, including the use of other networks such as Twitter, showed a gradual increase since the campaign kicked off last year. However, while Facebook comments and tweets from supporters of both sides are varied, the number of Facebook ‘likes’ recorded shows a consistent increase as the campaigns developed. 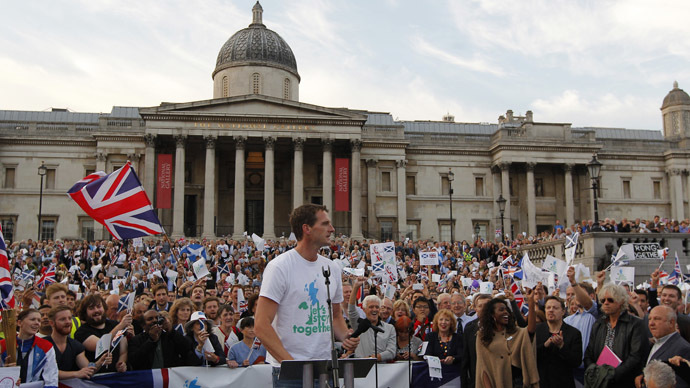 Shephard and Quinlan also found that the pro-independence ‘Yes’ campaign was much more active on social media, and scored more highly when it came to engaging with their supporters. The research also shows a gradual decline in social media activity from the unionist ‘Better Together’ group. While the ‘No’ campaign have led their rivals in terms of tweeting, the research shows that this lead has been narrowing as the referendum day draws closer. When we entered #voteyes into our program, we found that a huge number of users in our sample were engaging with each other, represented by the blue dots. Various ‘clusters’ of users represent high activity of people using the hashtag, while the large number of connections between the central clusters and users outside them ultimately show that the ‘Yes’ message is not only being tweeted more often, but users that tweet with the hashtag also frequently engage with others on social media. In contrast, we found that users using the hashtag #voteno were less likely to be as engaging on social media. As shown in the graph above, while clusters of high activity do take place, it is less likely that ‘no’ campaigners will share other content on Twitter or re-tweet content containing the hashtag. Ultimately, the graph seems to affirm the findings produced by the University of Strathclyde – that the ‘No campaign’ has considerably less of a presence on social media channels. While our samples were relatively small, at less than 1 percent, they nonetheless indicate that social media has been significant in developing the debate on Scottish Independence. And while there isn’t enough evidence available to suggest that it will have an impact on the final call, it’s worth considering that the most active people on social media, aged between 16-25, may be the referendums’ kingmakers.